Emailing might not be the most ideal activity for children, but kids often want to emulate adults in as many ways as possible. One could argue it’s healthy to allow kids to use emails to send notes and drawings to grandparents and other family members using this app from Tocomail. It comes with complete parental controls and allows parents to set limits as well as monitoring of their child’s messages. Check out the video here. In just two days, an iPad app focused on teaching kids how to code reached its $25,000 fundraising goal on Kickstarter. So far, the app, called ScratchJr and being developed in a MIT Media Lab and Tufts collaboration, has raised more than $45,000 since it launched March 17. Organizers of the project describe ScratchJr as an introductory programming language that “enables young children (ages 5-7) to create their own interactive stories and games. 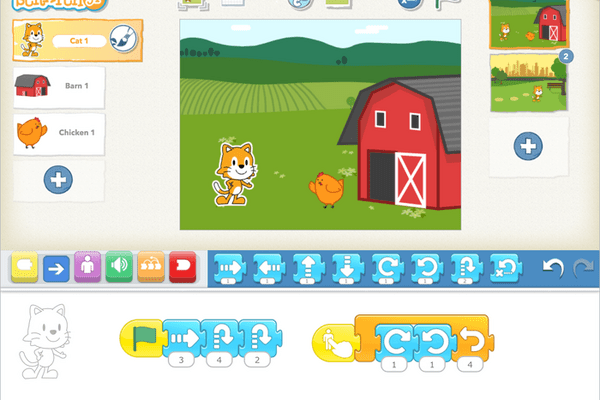 Children snap together graphical programming blocks to make characters move, jump, dance and sing.” ScratchJr uses Scratch, a free educational programming language geared towards kids and developed at MIT. Just Joking from National Geographic Society is a free app download that gives a sample of 25 kid-safe jokes. Additional “laugh packs” of 100 jokes can be purchased for $0.99. Expect to see random jokes while learning about subjects such as animals, science, space, or weather. You can even shake the phone to get a random joke. A mother of two young boys has sued Google for allegedly allowing her children to ring up debit card charges within the Marvel children’s app “Run Jump Smash.” Read the full article here. Following up yesterday’s post, the NY Times also featured a helpful video featuring tips for parents to make their tablets and smartphones more child-friendly before handing them over. Definitely worth the watch. Great NY Times article today about interactive programs on tablets made specifically for kids. The children’s entertainment publisher ToyTalk created an interactive program, the Winston Show, and as your child talks back to the characters in that show, parents get emails with subject lines like, “Your kid said something awesome.” Good stuff.